A few follow-up papal postings. I miss having Pope Benedict here. What an amazing week. Great WA Post article, A Lunch With Devotion, by Franco Nuchese of Cafe Milano. Nuchese was chosen to prepare lunch for Pope Benedict and 20 cardinals and archbishops. "So I directed my energies into putting together a once-in-a-lifetime event. Creating the perfect meal in a memorable moment is my craft, much like an artist creates a painting." Italians do know how to dine. Hat tip to The Anchoress. Andrew Bostum compares and contrasts Pope Benedict's attitudes and writings on Jews and Judaism with those of Muhammad Sayyid Tantawi, the current Grand Imam of Al-Azhar University in Cairo, Egypt. Tantawi is as close as you're gonna get to an Muslim Pope. To put it mildly, the differences are huge. Tantawi’s Ph.D. thesis, Banu Israil fi al-Quran wa-al-Sunnah (Jews in the Koran and the Traditions), published in 1968-69, provides numerous examples of anti-Semitic writings found in the Koran. Tantawi doesn't refute any of it, and in fact, he has continued to make rather vile utterances about Jewish people. "Indeed, the modern pronouncements and teachings of the Roman Catholic Church — personified by the words and actions of Pope Benedict XVI — stand in stark relief." Patricia Rice wrote a very moving article about the Pope's meeting with five people from Boston who were victims of the sexual abuse by priests. "For six days we watched and listened; we came to know Benedict as a cerebral and soft-spoken man whose body language was endearingly awkward and whose pen seemingly never rested. He is warmer than we expected, and he is braver than we knew. Overwhelmingly, though, Benedict is gentle and exceedingly, edifyingly humble. He is a Supreme Shepherd' but one who allows himself to be led, and ever led, by the Divine one." These have been amazing days, friends, and in that moment by the fountain it became clear that, as in a miracle, the tide had, at long last, begun to turn. His own energy-level at an apex unequaled over his three-year reign, Papa Ratzi might be heading home tonight... but, church, our work is just beginning. It's been said before but bears repeating: "the Holy Spirit is ready -- but the answer depends on us." It's the call of our time, and the work of renewal is already underway in our midst. But it can only happen if each of us go "all in." Gratefully, it's not a question of programs, budgets, committees or technologies. All it takes is just one word -- YES. It's time, gang -- our time. All in, all together, let's get to it. Gregg Wayland of NECN said, "Today, there was an abundance of grace at Yankee Stadium." I got back tonight from the Papal Mass celebrated at Yankee Stadium today, and it was an amazing and wondrous event. This one will take a few days to process, these are just my quick impressions. It was probably a once-in-a-lifetime event. I was one of the 57,000 very lucky people who cheered, prayed, chanted, listened intently, waved cloths, sang, and cheered some more. The music was amazing, just beautiful music that elevated and transported one to a higher plane. The papal choir and orchestra were top-notch, the songs were almost all classics of the church. All around the stadium, everybody was smiling. When the Mass ended, most people stayed, listening to the music and waiting for another glimpse of the beloved Holy Father in his popemobile. There were lots of young nuns and priests there, good to see. The nuns had all sorts of different habits. Good to see that too (instead of nuns wearing drab "normal" clothing, indistinguishable from anyone else walking down the street). 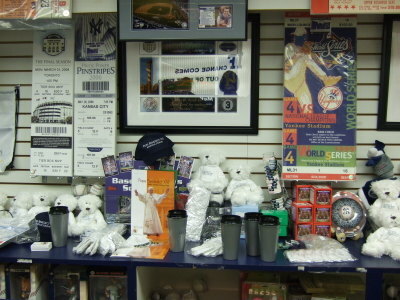 Yankee souvenirs replaced by Pope souvenirs for a day. Yankee Stadium was an odd setting for a mass, and it lent itself to spontaneous cheers and outbursts of love for the Pope during the Mass. One group, the Neocatechumenal Communities of Boston, was particularly jubilant, they started several chants of "Be-ne-dic-to!" and "Alleluiah!" The Pope didn't encourage it or milk it, but he would make a modest gesture to acknowledge their expression, such as slightly raising his hands and facing the crowd. Then he quietly returned to celebrating the Mass. I've noticed throughout the Pope's visit that he makes small, shy gestures that are packed with meaning. You have to watch and listen carefully to this Pope. 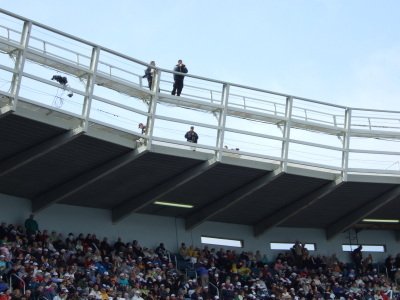 Security around the top of Yankee Stadium. What else? There were a number of short chants or songs in Latin that we all sang, and they sounded great! I'm sure most people who attended this Mass had never sung these words before, and it sounded wonderful. OK, we had a papal choir and orchestra leading things, not to mention a great cantor, but also that's the beauty of these Palestrina and Gregorian chants. They are musically simple, with few notes and not much difference between notes (it's not a reach going from low notes to high notes, as in some songs). That 57,000 people who've never sung together in their lives managed to sound pretty damn good singing these short pieces. Which should dispel the idea that Gregorian chants are too difficult for ordinary church-goers to sing. Yes, we can!! We did it at Yankee Stadium! 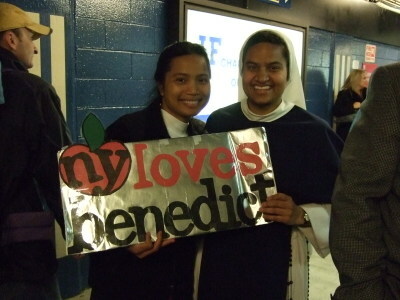 Thank you, Pope Benedict and New York Archdiocese, for a wonderful selection of songs and chants. Listening to this Mass, you'd swear you were in a cathedral. The atmosphere was jubilant and reverent. The homily was wonderful (again), "Dear bruzzers und ziz-tears in Chrisst", with the Pope reminding us of what many good things Catholics have done in this country, our schools, hospitals, and charitable organizations. We've gone from being a religious minority viewed with distrust and suspicion to becoming a group with significant influence on the wider society. He called on Catholics to know and live our faith, to blend our religious ideals and aspirations with the wider secular, democratic society. Whispers in the Loggia has the full text of the homily here. 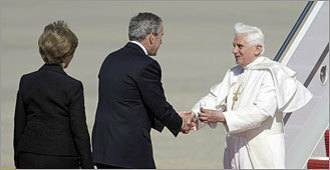 Pope Benedict has sent a good many messages out in this trip to many different groups in our country. I sense a follow-up blog here on some of those messages. My seat was way up high in the top deck between home plate and first base. Even with binoculars, I couldn't see the stage very well. 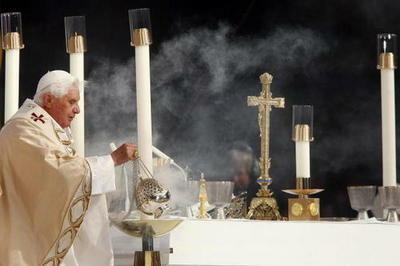 But I did see the Pope incense the altar, and several seconds later, the fragrant smoke came wafting up to us. Although I could barely see Pope Benedict, I feel honored and blessed to have been there today. There truly was an abundance of grace there today. Many hearts were touched. Many people's faith was renewed and strengthened. Ken who commented below took a terrific photo of the altar. Deacon Gregg wrote about it here (more photos) and here. Update: I wrote this as a comment over at Tea at Triannon, who linked here, so I may as well write it here too: "The Mass was incredibly moving. I truly feel renewed in my faith in Christ." Nice recap of the week in photographs here (hat tip to Tea at Triannon). Whispers in the Loggia keeps us up-to-date on the Pope's itinerary today. The program for all the public events can be found here. 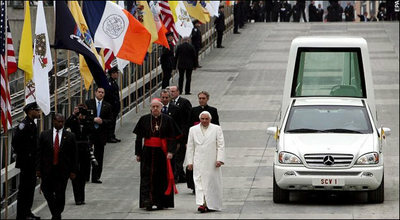 "At 9am, cheered on by a ticket-only gallery stretching down blocks of Fifth Avenue, the Popemobile will be received on the steps of St Patrick's Cathedral....Benedict will celebrate a Votive Mass for the Universal Church with representatives of the clergy and religious from each of the nation's 195 dioceses in the church long recognized as Stateside Catholicism's de facto "capitol building," .... today will be the first time a pontiff has celebrated the Eucharist within its walls." In another first, yesterday was the first time that a Pope visited a synagogue in the United States, the Park East Synagogue on East 68th Street. "After a brief riposo at the Mission House on 72nd Street, the spotlight moves to Yonkers -- more specifically, Dunwoodie, home of St Joseph's Seminary. On his arrival at 4.30pm, the pontiff will hold a prayer service for disabled children in the seminary chapel, before moving outside for one of this visit's three main public events: the youth rally before a crowd now estimated at 26,000...."
I'm watching the Pope giving his homily now. He looks a bit fatigued today. "To hear him speak is like a long, cool drink of water after being parched for too long. I'm amazed at the meat and substance of what he says and his way of making it so fresh and new." Might have to get me an I-Pod and download Vatican podcasts after he returns to Rome. I didn't think it was even possible, distributing Holy Communion to 50,000 people at the DC Mass. I thought there would be concerns about some idjit pocketing the host and trying to sell it on ebay. But they did it and they'll do it again in NYC on Sunday. It didn't even seem to really take that long at the DC Mass, they had some 300 priests and deacons giving out communion. I found it interesting in the DC Mass that people were taking communion in a variety of ways, in the hands, on the tongue, some bowing first, some kneeling. A few women wore veils or a hat, most did not. I have a feeling we'll see more veils in New York. Safety-conscious folks can check out this video about how communion will be distributed, even in the bleachers and steep upper deck. I love the contrast between the speaker's New York accent and the Gregorian chant in the background. Friday: Papal Candlelight Vigil, 9:00 pm - 12:00 am, 5th Ave at 72nd Street. "The Archdiocese will provide 1000 candles for the faithful outside the Pope’s window. I wouldn’t be surprised if he pokes his head out to say hello." More info from the Archdiocese on the Pope's visit to NYC here. The Pope has spoken out daily during this papal visit about the sexual abuse crisis in the Church, and yesterday he met with five (six?) people from Boston who were abused by priests. The Anchoress has a thoughtful look at this matter. What these priests did was horrible and criminal. What the bishops did in moving priests around from parish to parish was horrible and criminal. But as The Anchoress points out, how society handled child abuse (or domestic violence) was very different 30 or 40 years ago than how we deal with this today. Child abuse wasn't spoken of, it was often denied, it was covered up. "There are no easy answers, no magic words of apology that will make victims feel healed and whole. The pope has made an important speech and the church in America and elsewhere have taken very solid steps to assure that these awful things may not happen again, and to console victims. She will have to do a bit more and I believe she will; she is treading new waters…but at least the treading has begun." "I pray for all victims and also for the good priests who have been treated to suspicion because of their sinful priest brothers. As the bad soldiers at Abu Ghraib managed to dishonor hundreds of thousands of good men and women, so have these bad clerics hurt tens of thousands of sincere and dedicated priests." Salve e Benvenuto, Il Papa! Shepherd 1 has landed at Andrews Air Force Base (AP photo). The Pope's itinerary is here. A program for the public events, including liturgy for Vespers at the Basilica of the National Shrine of the Immaculate Conception, and Masses at Nationals Park and Yankee Stadium, is here. It's never been done before. I get the sense that Bush wants to be in his presence for as long as he possibly can. And I really am starting to believe he will convert when he leaves office. "The culture war is a war of ideas and images. The imminent images -- touchdown about a half hour away! -- of President and Mrs. Bush welcoming Pope Benedict XVI to the land of the free and the home of the brave will travel all the way around the world before the big lie has a chance to put its pants on." Ringing Church Bells for Pope is Catching On! "....as for 'Dem Bells, it seems the ringing'll be taking place far and wide come Touchdown Time, tomorrow at 4pm Eastern." "Among others, both the Stateside church's oldest cathedrals -- Baltimore's Basilica of the Assumption and St Augustine Cathedral-Basilica in Florida -- will let 'em rip for three minutes. In New York, the Actors Chapel at St Malachy's on Times Square's joining in, as is the capital's oldest parish, St Mary's in Rockville... and somebody said that the idea even got pitched on EWTN this morning." "Church bells across the Roman Catholic Archdiocese of Newark will ring at 4 p.m. Tuesday in honor of Pope Benedict XVI's arrival at Andrews Air Force Base, for the start of his six-day U.S. trip that includes stops in Washington and New York. The bells will ring for about two minutes. The archdiocese includes Essex, Union, Hudson and Bergen counties." I know churches in Lowell are participating too. Church bells ringing across the country!! Ring the Bells to Welcome Pope Benedict? "When Shepherd 1 touches down next week, Catholics all over the United States will joyfully welcome Benedict XVI our Church’s spiritual leader. To mark this momentous event I have a modest proposition to put forward: The simultaneous ringing of all Catholic Church bells across the entire country." PewSitter proposes that every Catholic church ring their church bells for 10 minutes next Tuesday to joyfully welcome the Bishop of Rome. 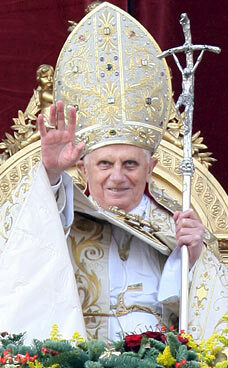 Landing time for Pope Benedict is 4 PM EST next Tuesday, April 14. I agree with Whispers in the Loggia, ten minutes is a bit much. Three or four minutes is plenty and would still be a wonderful way to mark this significant visit. Please pass the word to your own priests, pastors, nuns, deacons, everybody! 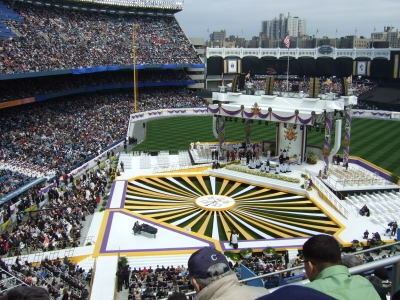 We're nine days away from seeing the Pope at the Mass he's celebrating at Yankee Stadium. Good time for a novena to help keep Papa Ratzi safe during this trip, to give him energy, strength and support. I think the Novena to St. Benedict would be appropriate here, yes? Peggy Noonan penned a lovely article about Pope Benedict and his predecessor, John Paul II, Something Beautiful Has Begun. And it has, and it's coming here in nine days! Papal correspondents Sissie and The Anchoress provide many links and thoughtful commentary here and here. I thought this DC Metro ad was pretty funny. Unfortunately, it got yanked. Something about concerns from the Archdiocese of Washington about the color of his cap. I don't think the bobblehead looks anything like Pope Benedict. Cute ad though. "Why does Benedict XVI wear all the old fancy gear? Does he just like dressing up? Does he like to display the power and pomp of his office? In fact, it is all part of his commitment to what he calls 'the hermeneutic of continuity' that is to say, that the Church today is built on the past, and what we do today, liturgically, pastorally, politically, spiritually, is empowered and enabled by our faithfulness to the past. This is not to turn the clock back. The Pope is not one of these arch traditionalists who want to return to the 1950s. Instead he believes that the past rightly informs the present, and that there must be a continuity in the tradition so that the faith that we have received from the apostles can continue to thrive. So, in wearing vestments and using a crozier from three earlier popes Benedict XVI makes visual the continuity of his office and the continuity of his teaching." The Pope's "Message to the American People" available here. "In any case, the general judgment on the United States has shifted to the positive, to the same extent that judgments on Europe have become more pessimistic. To (U.S.) ambassador Glendon, Benedict XVI said that he admires 'the American people's historic appreciation of the role of religion in shaping public discourse,' a role that in other places – read, Europe – is 'contested in the name of a straitened understanding of political life.' With the consequences that stem from this on the points that are most crucial to the Church, like 'legal protection for God's gift of life from conception to natural death,' marriage, the family." "...The Church authorities appreciate in any case the fact that all of the (presidential) candidates have given a prominent place to the religious dimension." "Because that's the way the United States is. It is at the vanguard of modernity, and at the same time is the most religious nation in the world. It is a model of separation between Church and state, at the same time is a country with a significant public role for the religions. The study by the Pew Forum has found that at the numbers of atheists and agnostics are very small, 1.6 and 2.4 percent respectively, in spite of the fact that they seem much more numerous and outspoken in the media." But no sense reading too much about the Pope's visit, especially on the computer. Just open up space in your heart and prepare to spend some time to listen to this remarkable, learned and holy man. I recently read an essay by the Pope, probably it was in the monthly Magnificat, and he quoted from the Catholic catechism, something along the lines of "God has etched a yearning for the divine on the human heart." It's there. Just be still and listen. I think Sissie is as excited about the Pope's visit to the U.S. as I am, which is MUCHO MUCHO MUCHO. She's got an excellent blog post up, lots of links, great quotes ("If you want to avoid turbulence, you have to stay at home"), and another photo of Papa Ratzi wearing his Saturno hat. The beloved Pope Benedict will be celebrating Mass at Yankee Stadium in only two weeks from tomorrow!! I got my ticket! His birthday, by the way, is April 16 (he'll be 81). Get your details on the Pope's visit to NYC next month here. I've got my ticket, and I'm very much looking forward to being in Yankee Stadium for Mass on April 20! I generally loathe big throngs of people, but I'm sure this will have a very different feel than most crowded events. Interesting article on the differences in outreach and proselytizing by Christians, Jews and Muslims in Saul Singers' article, Interesting Times: Let the Pope Be the Pope. "On Easter this week, controversy has swirled around Pope Benedict XVI, both for personally baptizing a prominent Muslim Italian journalist and for allowing the revived Latin mass to hope that Jews convert." "...The Pope wants Muslims and Jews to become Christians. Should this be a surprise? If the Pope won't advocate Christianity, who will?" Via Cardinal Sean O'Malley's blog comes info on how to score tickets to attend Mass with Pope Benedict at Yankee Stadium in NY on April 20. Must be a registered member of a church within the Archdiocese of Boston, which has 3,000 tickets to distribute. If more than 3,000 people request tickets (a certainty), there will be a lottery. Must register by 5 P.M. on February 11th, info here, it's easy to do online. 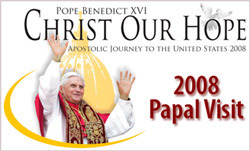 Papal intinerary here, includes a visit to the White House (second time in history that the pontiff has visited the WH), Mass in DC on April 17, Pope addresses the UN on April 18, visits Ground Zero on the 20th (AM), Mass at Yankee Stadium also on the 20th (2 PM).